What a crazy two weeks it has been! I feel like the worst vintage blogger ever. Why? Because I have not been able to do a proper blog post. I've been so busy working and getting used to my new job.. yes there is a lot to learn and I want to do the best I possible can. That goes without saying and I always put 100% into everything I do. Now that there is no overtime at work I feel like this is the best opportunity for myself to sit down and think of ideas and do different blog posts for you all, my readers. Why am I still rambling on to myself? I have no idea. A few weeks ago I saw on Itunes that Lana Del Rey was realising her new album and I thought this is going to be good. Even better a few days later I noticed she was releasing a vinyl and I could not wait! 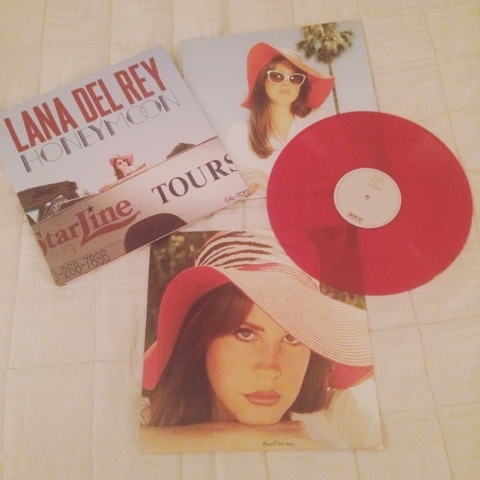 Last Wednesday I bought the vinyl 'Honeymoon'. It was £18.99 from the HMV store but seriously its amazing! One of the best vinyl's I have ever bought. 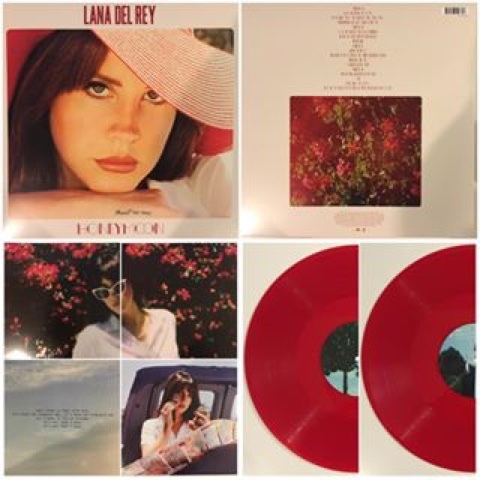 The vinyl cover is a summery hollywood look with Lana in a retro car. The desigh/look of 'Honeymoon' is stylish and has a 1950's theme to it. Both vinyls are a bright red, with a book of pictures and lyrics inside. Defintely worth buying it, my favourite songs are High by the beach, Honeymoon and God knows I tried. You also get a book that is filled with lots of pictures with Lana and writing too. This record is the darkest album she has wrote. I think its my favourite too! I hope you liked this blog post. I really hope you go and check her album on Itunes out. It's probably a good thing to o if you are unsure about buying the full album or vinyl. I however, did not do this but love every minute of it. It's one vinyl I'm always going to love and enjoy!! I will be back soon with another blog post but catch up with my social media, twitter, instagram and bloglovin (lottieslott).